Welcome in the big Island of Cuba, the largest in the Antilles. With almost 6000km of beaches of white sand, its tropical flora covering its many mountains, its colonial cities and its peaceful countryside, it is easy to fall under its charm. The European and African influences, mixed with the aboriginals and Asians, gave birth to a very characteristic and diversified people. They are a warm people and very sympathetic. Their blood is hot, especially when the hypnotic rhythms of Cuban music are heard nearby. 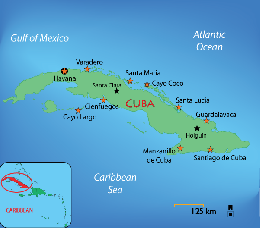 The Cuban economy consists mainly of sugar cane, rum, tobacco, coffee, exotic fruits, fishing, pharmaceutical and biotechnological industries, nickel mining and especially tourism. Education is free for all the levels and is obligatory until the end of high school. Medical services are free for all Cubans.